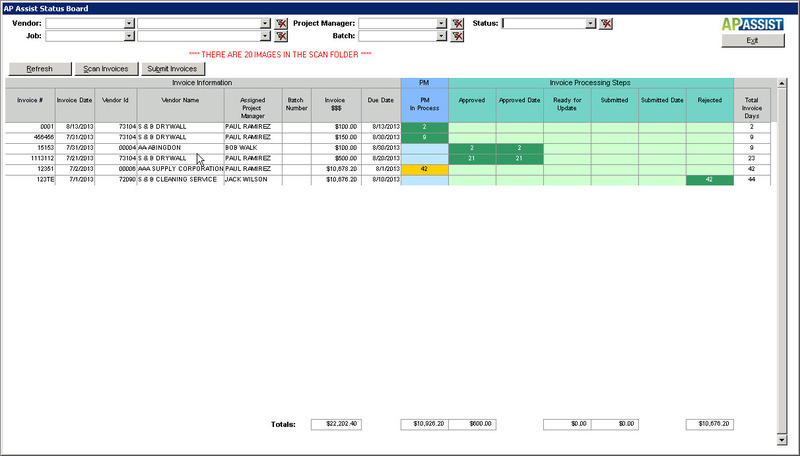 All contractors write purchase orders and all contractors have to process invoices against those purchase orders. The challenge for most contractors is managing the workflow involved with that process which includes ensuring that the invoices paid do not exceed the purchase order amounts. APAssist is the construction process management tool that can integrate with your existing accounting software to track and manage the accounts payable process from start to finish. detail allows for entry, processing and approval of invoices from anywhere, at anytime. accounting and purchasing department staff as well. With integration into your Purchasing software, you can see side by side quantities and prices, and invoice to PO. This will ensure that the invoice quantities and amounts tie directly back to your purchase order. the point of entry, to approval, to payment.